According to an article in National Geographic(2012), Shiba-inu(a Japanese dog breed) and wolves are closer genetically than other breeds of dogs and wolves. In Japan wolves were called Yama-inu(wild mountain dogs) in the past. Musashi-mitake Jinja Shrine located at the top of Mt. 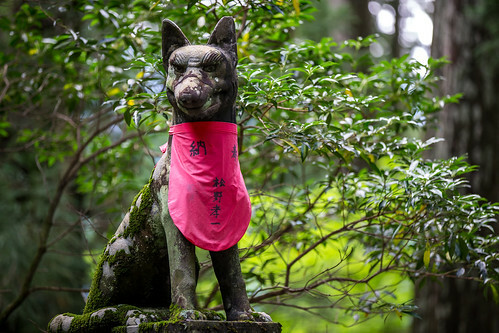 Mitake has enshrined a Japanese wolf as the deity “Ooguchi Magami”. According to Chronicles of Japan, a white wolf led the way when Yamato Takeru no Mikoto(a Japanese legendary prince of the Yamato dynasty) got lost. The wolf commonly known as Oinu-sama has been an emissary or a subordinate to a deity. Oinu-sama has been enshrined as a guardian deity of mammalian pest control, fire and theft protection, protection against every accidents. Though meat-eating was officially prohibited on several occasions in Japan, game meat was available. There was very little livestock farming. So wolves benefited arable farmers. They got rid of deer, bear, wild boar, hare and other hungry animals which can ruin a crop. The shrine is also dog friendly. Visitors can request a prayer specifically for dogs. Amulets for dogs are available. Go-shuin means a seal stamp given to worshippers at Shinto shrines and Buddhist temples in Japan. 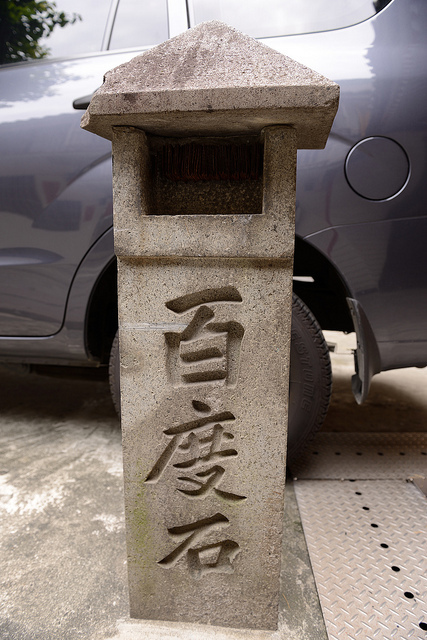 Go-shuin includes information such as the name of the temple and the date of visit written in calligraphy. It will be an 10 minute bus ride from Mitake station(JR Ome Line) to Takimoto Station(Mitake Tozan Cable). After 6 minutes funicular ride visitors arrive at Mitakesan Station. The shine is 25 minutes walk from the station. Each funicular car has a space for dogs. Around the shrine there are 26 Shukubo(pilgrim's lodging) that date back to the Edo Period. Shukubo are popular with worshippers, climbers, and hikers. There are a lot of Shinto shrines which enshrine Japanese wolf in Japan. Mitsumine Jinja Shrine in Chichibu City, Saitama Prfecture has also enshrined a Japanese wolf as the deity “Ooguchi Magami". A bronze torii(built in 1845) , Yatsumunemokutodai, chozusha are at the top of these stone steps. Yatsumunemokutodai (八棟木灯台) is a decorative wooden lighting fixture built in 1857. Cedar trees are estimated to be 800 years old. Okariya literally means a temporary shrine. Rituals dedicated to the wolf deity are performed here because the deity usually remains sequestered in the mountains. Okumiya (Inner Shrine) of Mitsumine Jinja is located at the top of Mt. Myohogatake and is 90 minutes walk from the front shrine. Please note that bears may frequent the area. Komainu (狛犬, lion dogs) derives from Chinese guardian lions. A pair of komainu are placed either at the entrance of Shinto shrines, or somewhere inside. At the shrine, a variety of guardian wolf statues stand instead of lion-dog ones hither and thither. Most statues wear bibs offered by believers. It is said the bibs come from a prayer to Jizo(地蔵, Ksitigarbha in Sanskrit). Though his mission is to save people between Buddha's death and the appearance of Maitreya(弥勒菩薩, Miroku-bosatsu), Jizo is also regarded as the guardian of children because he saves dead children who have to pile stones endlessly like Sisyphus at the banks(Sai-no-kawara) of death's river (Sanzu River.) The children can't cross the Sanzu River because they predeceased their parents. Ogres unpile the stones before the children complete a tower, but Jizo gives the children salvation in the end. It's thought that parents whose child died started to offer bibs in prayer to Jizo for their child. This is considered as the beginning of statues wearing bibs in Shinto shrines and Buddhist temples. Mention dogs, and "the dog shogun" Tokugawa Tsunayoshi comes to mind. Tokugawa Tsunayoshi (徳川 綱吉, 1646-1709), the fifth shogun of the Tokugawa Shogunate, is known for the Edicts on Compassion for Living Things (生類憐みの令 Shoruiawareminorei). He prohibited the killing of living things including humans. The law was a series of bans. He made an extensive dog shelter with an area of approximately 990,000 square meters in Kakoi-machi(former area around Nakano 4-chome, Tokyo). The shelter had five-part fenced-in grounds and each part had a doghouse, a feeding ground, a bower, a puppy breeding facility. About 80,000 dogs had lived there between 1695 and 1709. Some veterinarians and officials were assigned there. Dog statues stand in front of Nakano City Office where the dog shelter used to be. In recent years, Tsunayoshi has been re-evaluated as an exceptionally talented policymaker. At the time, Japan had a savage atmosphere in the post war period. He tried to change people's consciousness so that they were attracted towards non-violence and had moral fiber. The law aimed to show mercy to living things including humans. 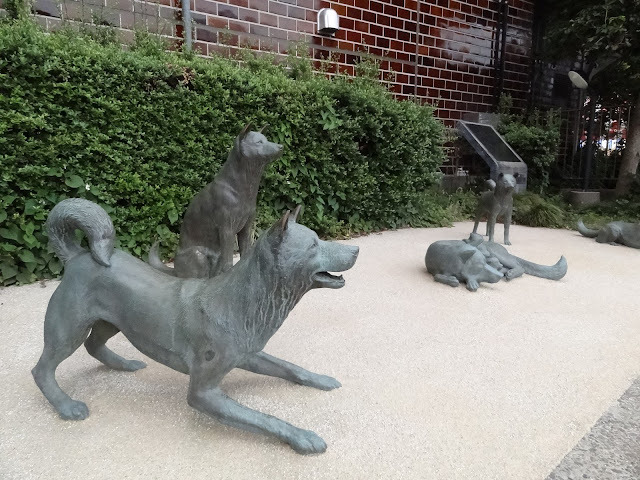 In Edo(former Tokyo) a lot of feral dogs roamed the streets. They often did harm to people. On the one hand, some people killed them, and some gangsters ate dog meat. Tsunayoshi housed them in his dog shelter. Sick cattle and horses were abandoned. Samurai often injured horses to improve their appearance. He banned abandoning and injuring them. Animal shows by snakes, dogs, cats, and mice were banned. "Living things" included humans. At the time many children and very sick persons were also abandoned. He strictly prohibited abandoning them. Additionally, he promoted improvement of prison environments. He obligated people to register the names of pregnant women and children aged seven or under, the numbers and owners of dogs, cats, cattle, horses and firearms. The shelter's dogs were fed by taxpayers' money. People were deeply frustrated with his overly tight control for the protection of living things including dogs, cats, birds, fish, shellfish, and worms. However, it it said that his retainers expanded the ban to include all of living things. After his death, the shelter was demolished and most of the bans were abolished. The bans against abandoning cattle horses, children and sick persons remained. When an apartment caretaker of Nagaya(one story tenement house) found an abandoned child in front of his apartment, it was his duty to find homes for the child. Stone notice boards called Maigo-ishi were built along the busy streets in Edo. Handwritten notes posted on the stone let passersby know about homeless and missing children. 2018 is the Year of the Dog according to the Chinese zodiac. So I raise some topics about dog statues and sculptures. The Hachiko statue is famous worldwide. His name was Hachi. He was affectionately called Hachiko. 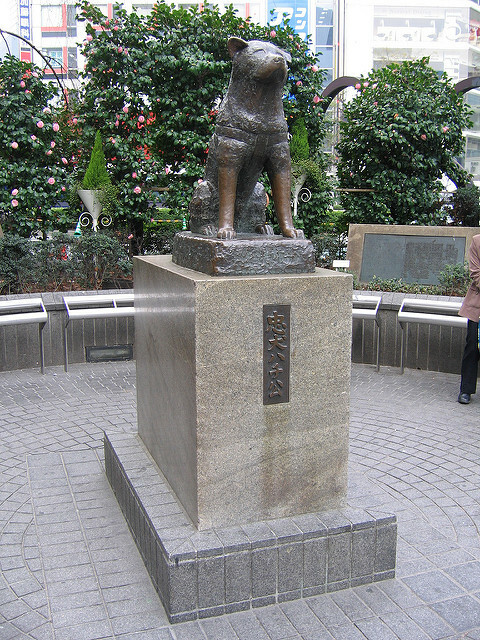 Surprisingly, Hachi himself attended the unveiling ceremony of the Hachiko statue in 1934, in his lifetime. There is a dog statue at Daruma-ji(達磨寺) Temple in Oji-cho, Kitakatsuragi District, Nara Prefecture. His name is Yukimaru(雪丸.) He is said to have been the dog of Prince Shotoku(574-622) who was regent and a politician of the Asuka period in Japan. Legend has it that he was able to talk human language and chant a Buddhist sutra, and he left a will to bury his body in the temple. The statue is considered established in the Edo Period. The statue of Yukimaru is mentioned in Yamato meisho zue, an illustrated guide describing famous places in Nara Prefecture, published in 1791. The official character of Oji-cho(Oji Town) is also called Yukimaru. 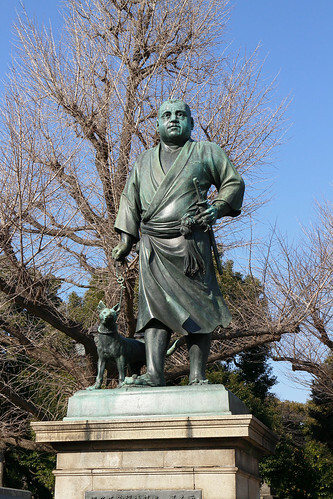 Saigo Takamori's bronze statue in hunting attire with his dog based on a Satsuma dog stands in Ueno Park, Tokyo. He went hunting a lot, so he had many hunting dogs including the female Satusma dog Tsun. One of his dogs named Tora accompanied him on a visit to Gion, a geisha district in Kyoto. He brought his dogs to a war zone. With the situation deteriorating, he unleashed his dogs. Saigo Takamori(1828-1877) was a Japanese samurai from Satsuma(former Kagoshima), a military commander, a politician. He was dragged unwillingly into the Satsuma Rebellion and committed seppuku as a leader of the rebel group in 1877. His honor was restored through efforts of many people including the Emperor Meiji in 1889. Myoe (明恵) (1173–1232), a Japanese Buddhist monk, kept a wooden puppy dog with him all the time until his death. He revived an old temple and established the Toganowosan Kosanji Temple in Kyoto. The wooden figure has been designated as a nationally important cultural property. Kosanji Temple is home to several works of art, including Choju Giga (Scrolls of Frolicking Animals), the puppy figure. However, the scrolls are now entrusted to the Kyoto National Museum and Tokyo National Museum. Maruyama Okyo (円山 応挙, 1733-1795) was a popular painter and left a lot of puppy paintings. Okyo-kan is located in the Tokyo National Museum's garden. The building was built in 1742 as a shoin (study/drawing room) at the Myogen'in Buddhist temple in Aichi prefecture and was moved to the current location in 1933. Myogen'in was also known as the oldest eye clinic in Japan. Okyo engaged in the ink paintings on the interior walls and sliding doors because he was a patient of the clinic. 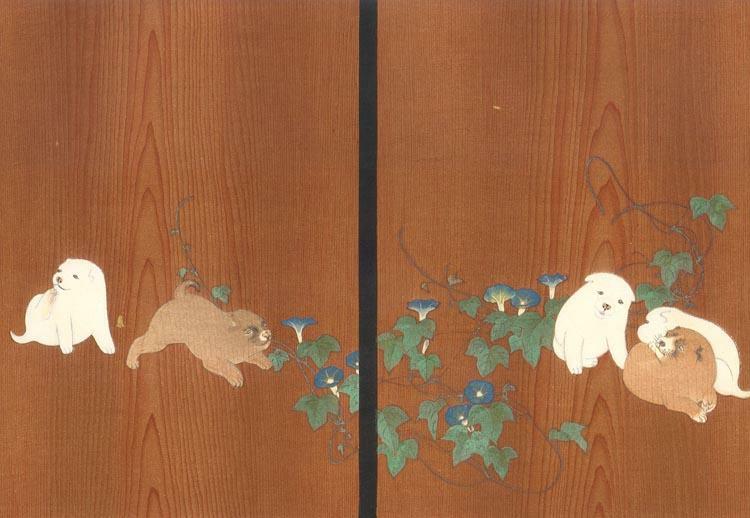 Puppies and Convolvulus were painted on a Japanese-cedar sliding door of the building. Motoinu(ex-dog) is a program of Rakugo(comic story telling). Rakugo performers play several characters and narrate in one-person shows. They can only use a Japanese fan and a washcloth as a prop, kneeling on a cushion the whole time. They use a Japanese fan to resemble a kiseru (Japanese smoking pipe), a letter, a sword, chopsticks, an ink brush, a fish pole, an umbrella, a sake server, and so on. Or they pretend that a washcloth is a wallet, paper, a book, a cigarette pouch, and so on. There was a popular belief that white dogs could be reincarnated as human beings in the next life by praying fervently to the gods. In Buddhism any human could be reborn as animal, and any animal could be reborn as a human. In this story a white dog named Shiro(shiro means white) performs a ohyakudo-mairi(hadashi-mairi in another version) at a shrine to pray for be reincarnated as a human. He visits and prays at a shrine for 21 days. On the morning of the last day, he turns into a naked human. An ex-dog man draws a lot of laughter. Ohyakudo-mairi is circumambulating between the entrance(stone marker set in the grounds) and the main hall at a shrine or temple a hundred times, with offering prayers in front of the main hall. In Hadashi mairi, prayers schedule a block of days to visit and pray at a shrine or temple barefoot. A version of Motoinu is set at Kuramae Jinja Shrine(former Kuramae Hachiman) , Taito Ward, Tokyo. A statue based on this story stands at the shrine. Emperor Shomu(聖武天皇, 701-756) established provincial monasteries and nunneries(kokubun-ji and kokubun-niji) in each province of Japan. Todai-ji was positioned as the head of all these kokubun-ji. Empress Komyo(光明皇后, 701–760) established Hokke-ji Temple(法華寺) as the head of all the provincial nunneries in 745. She set up public facilities such as a home for orphans and the neediest and a free clinic to care for the sick and to treat patients with medication. The nuns of Hokke-ji have made the same dog-shaped talisman called Omamori-inu as one of the empress' own making. The charm is available only at the temple. Pre-order is necessary. Around noon on the 16th day of the 4th month in 1771, a dog from Yamashiro-no-kuni(former southern and central Kyoto Prefecture) worshipped at the Ise Shrine for the first time. The dog drank water at a chozuya(Shinto water ablution pavilion) and prayed while bowing its body in the open space in front of the main shrine. It is assumed that the dog accidentally arrived at the Ise Shrine by trailing behind a group of pilgrims. However, a lot of dogs had worshipped at the Ise Shrine since then. 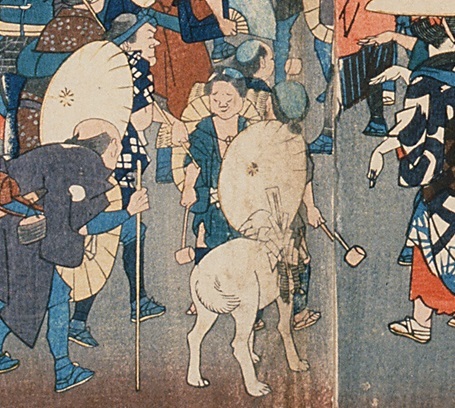 Most dogs were communally owned in the Edo Period. They were free-roaming in their villages. Dog owners or villagers put a wooden plate with their dog's hometown written on it and traveling expenses around the dog's neck. The dog was called Okage-inu. They entrusted their dogs to tourists. The dogs were handed over from a tourist to another like a baton in a relay race. Many people supported Okage-inu out of good intentions by traveling with the dogs, giving them board and lodging. Some dogs were sent alone to Ise. In the first half of the 19th century the head of the Ichihara family in Sukagawa, Fukushima Prefecture visited the Ise Shrine every year, but he got sick in a given year. His dog Shiro, a white Akita, was very clever. So he decided to send Shiro to the shrine on his behalf. He put a cloth neck bag including traveling expenses, pieces of paper with the directions to the Ise Shrine and a message to supporters around Shiro's neck. The family saw Shiro off at the end of the Sukagawa post station. After two months, Shiro came back from the shrine. The neck bag included ofuda(paper talisman) of the shrine, a receipt of votive offering of money, feed bill, and money left. Shiro died three years after his journey. He was buried in Junen-ji Temple, the temple of the Ichihara family. The family installed the grave with a stone carving of Shiro near their family graves. Even now, the family members offer incense sticks and put flowers on their family and Shiro's graves. "Okage-inu" was much talked about at the time. Most okage-inu were white dogs. Supporters felt proud of participating in dogs' pilgrimage like an Olympic torch relay runner. Some people got the wrong idea about some dogs. According to the book, a dog shuttled between Kuroishi in Aomori and Ise Shrine(the distance between two points is about 1200 kilometers) because someone mistook a dog to be a okage-inu. That's an unwelcome favor, but mistaken dogs were well-cared for by many people. The last recorded okage-inu was an antique shop owner's dog which went from Nihonbashi(in Tokyo) to the shrine in 1874. 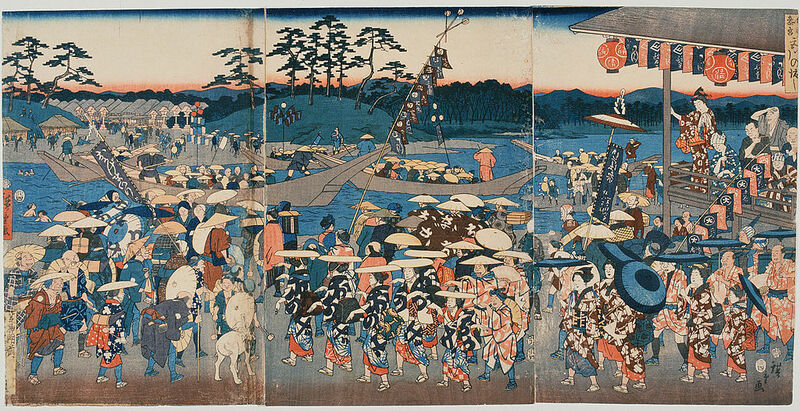 Commoners were prohibited from moving freely across Japan in the Edo Period, but only going in pilgrimage was allowed. They went on a sightseeing trip to Ise and other sacred places such as Todai-ji(東大寺) in Nara Prefecture, Kiyomizu-dera(清水寺) in Kyoto, Kotohiragu(金刀比羅宮) in Kagawa Prefecture, Zenkou-ji(善光寺) in Nagano Prefecture and Kumano-sanzan(熊野三山) in Wakayama Prefecture under color of religious pilgrimage. In the 1830s, 4.8 million people, which accounted for a sixth part of the total population in Japan, made pilgrimages to Ise Jingu. Some dogs also took a pilgrimage to Kotohiragu. They were called Konpira-inu. Even now, the shrine is dog friendly. Please mind your manners when you visit Kotohiragu with your dog.